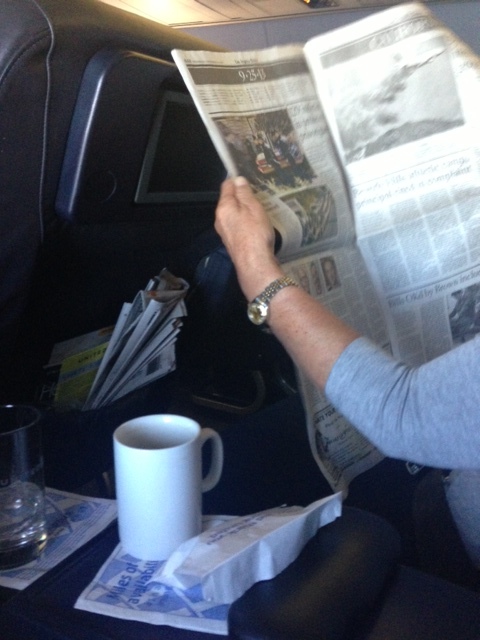 As I write this blog, I am sitting next to an older woman on a plane. She is happily reading a newspaper, while I am equally enticed by articles on my iPad. She continually struggles to make the paper fit her own limited area, by folding and then refolding the paper as she makes her way through the narratives that might already be outdated. I can see the ink on her fingers, and the smell of the paper is starting to give me a slight headache. Her reading is aided by her use of bifocals, which help her to read the small print. I keep thinking when will her arms give out, when will she get tired of holding the paper up and shuffling it to read? Her obvious struggle to read the paper is interesting to me. She is curious – and a learner – which I admire. However, watching her struggle is a bit painful for me. We are involved in the same pursuit, but I am doing it with a certain ease that comes from familiarity with technology. I am actually reading some of the same content, just online. I have adjusted the font to fit my eye strength. I have looked up meanings to words, validated the information by finding another source online and all with no ink or headache inducing stench. I have a record of the ideas I have highlighted and when the plane lands, I will snap the cover over my iPad and walk away – information still at my fingertips. She will leave the paper behind, to hopefully be recycled, and the information she gleamed is now at the discretion of her memory. Reading the newspaper is what she knows – it is her comfort level. Nothing is exactly wrong with this, but this scenario reminds me of our educational system. This juxtaposition of reading between her and I, reminds me of two 4th grade classrooms I recently worked with. Both had iPads, and both had great teachers. One class, however, made use of the devices to redefine how students comprehended content. The other class was still using the paper books and students were sitting in rows and listening as the teacher read the story, stopping periodically to discuss – iPads closed on their desks. The latter lesson is fine and is how I learned to read, but it reminds me of the lady with the newspaper. The reading could have been so much more dynamic, graceful and interactive but because of a comfort level – it unknowingly remained static and a bit motionless. Why is it important for students to learn how to read digitally? What makes digital reading such an important way to help students with their comprehension and information literacy? Students can easily organize and recall the information they deemed important or “tag worthy” within the digital reading context. The ability to highlight, tag or annotate text empowers students by helping them find and recall important quotes and content later. This skill is very valuable in an information abundant world. Students can color code passages relating to characters or symbols and quickly call up those passages later when they need it for a response to literature or debate. Students can look up definitions to words and easily keep a log of their new vocabulary – using another app like Notes or Evernote. Definitions to words are now only a tap away, making it easier to empower and fuel comprehension. When students are stumped by the pronunciation of unknown words digital devices allow them to easily get pronunciation help. With a tap of the sound icon the word is correctly read to them and they can practice their pronunciation right on the spot. This is really good for second language learners and students who struggle with phonics. If you can’t pronounce the capital of Burkina Faso – which is Ouagadougou – this might be a great time to call on the pronunciation tool to help you. Using apps like Subtext the teacher can pre-populate the reading with visuals that help assist in comprehension. Let’s say the class is reading about a gallon of blood but can’t seem to wrap their head around how much blood that really represents. A teacher could add a picture of a gallon of milk to the reading passage, and students could easily visualize how much that is by relating it to something in their everyday lives. Students can have the device read passages to them to aid in comprehension and to help them deal with content that might be a tad bit outside of their reading level. Audio Enhancements:CCSS.ELA-Literacy.RI.7.7 Compare and contrast a text to an audio, video, or multimedia version of the text, analyzing each medium’s portrayal of the subject (e.g., how the delivery of a speech affects the impact of the words). Apps like Subtext allow the teachers to easily add and embed an audio component into the reading itself. This way they are achieving this standard by adding the audio directly into the reading and helping drive comprehension. If a student has a problem reading the text, they can quickly and easily manipulate the size of the font to help them read more comfortably. I have even seen kids adjust the brightness and orientation of the page to fit their particular learning style. All of the information that you have highlighted or tagged follows you from one device to another and you never have to “throw it away” like a worksheet, notes or a newspaper. This way reading become something they do in a within a network of other learners who help guide them with their comprehension. Think about your classroom this year, do you want to help kids navigate through digital information and learn how to effectively read and comprehend by more effortlessly using devices? If so then begin the journey to digital reading and comprehension and help your students get ready for a future that might not include many paper resources and will be heavy in digital content. Holly will be speaking more about collaboration and connection at the upcoming iPad Summits.